The Staff of the Kwara State Broadcasting Corporation, Radio Kwara has debunked a Press release issued by the Special Assistant to the Kwara State Governor on Media, Doctor Muhydeen Akorede that they have resumed work. The staff in a telephone chat with a news mudium said the strike is ongoing until the state government meet the demands of the staff with the removal of the Sole Administrator as the topmost priority. The staff said they were outside the Broadcasting House, expressing their grievances over poor working environment and lack of working tools. They noted that all the claims of the Sole Administrator on a private radio station this morning was full of lies and deception, asking members of the public to visit Radio Kwara , Herald Newspaper and Kwara Television to see what is happening in the media houses. The staff added that shutting down of operations at both radio and television stations and inability of the Herald Newspaper to come out four times in a week had depicted what is going on in media houses. They also said "Some staff of the Bureau of lands visited the Broadcasting house yesterday's evening to take measurement of the land within the premises, indicating the intention of the government to sell the broadcasting house." 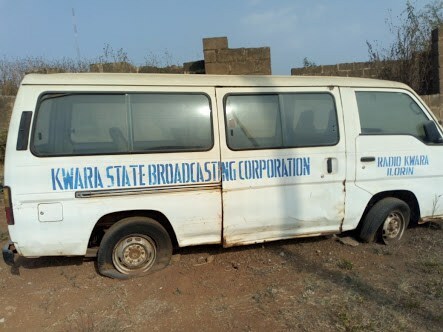 They insisted that the Sole Administrator must go before they can listen to the government, calling on members of the public, especially genuine individuals and lovers of Radio Kwara to support the station which is one of the heritage of the Kwara state in the ongoing struggles. Muyideen Akorede the sole administrator of the regime. The man who use N100M to buy furniture during Kwara radio rehabilitation.